On Friday 13 May 2016, the Brown County Texas Sheriff's Office (BCSO) received a missing person report for 25-year-old Rhonda Chantay Blankinship. Family members reported Blankinship had last been seen late Friday evening, walking near her home in the Tamarack Mountain/Thunderbird Bay area of Lake Brownwood. Friends, family and volunteers began a search for her while deputies followed up on possible leads into her disappearance. Blankinship's body was found at 5:20pm on Sunday 15 May in an abandoned, dilapidated house in an area of isolated countryside, roughly five miles from the home where she lived with her grandfather. Evidence suggested Blankinship was a victim of homicide and investigators recovered a lawn mower blade, which they believed was the murder weapon. Her body was sent to the Tarrant County Medical Examiner's Office in Fort Worth for an autopsy, which showed she had been sexually assaulted and died of blunt force trauma consistent with the mower blade. Given the severe nature of the crime, the FBI and the Texas Rangers assisted BCSO in the investigation. Several suspects were interviewed and polygraphed during the investigation, but none of the leads panned out. Three weeks into the investigation, Brown County Commissioners Court elected to hire the Tarrant County Medical Examiner's Lab to conduct DNA testing of several pieces of evidence in the murder case of Chantay Blankinship. A male DNA profile was developed, but it produced no hits in the CODIS DNA database. It was nearly a year and a half after Blankinship's murder, with no suspects and no remaining leads, when BSCO Sgt. Scott Bird learned about Parabon's Snapshot DNA Phenotyping Service, after watching a true crime television show on which the technology was featured. 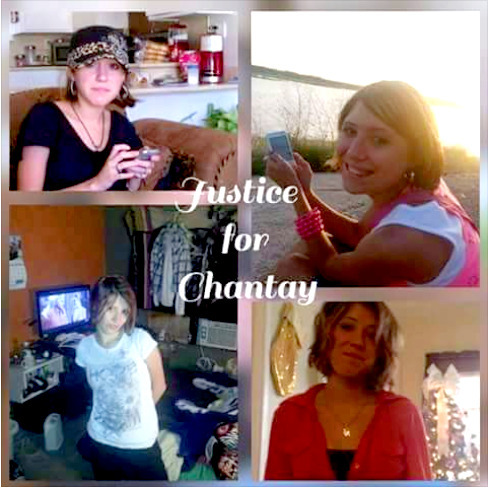 Bird recalls, "We were determined to solve this case, for Chantay and her family, but we had nothing tangible to go on. It seemed like Snapshot might be able to point us in a useful direction." A comparison of the Snapshot composite profile and a photo of Ryan Derek Riggs provided at the time of his arrest. Soon thereafter, the Brown County Sheriff, Vance Hill, and District Attorney, Michael Murray, engaged Parabon to produce a Snapshot report on the male DNA obtained from the crime scene. 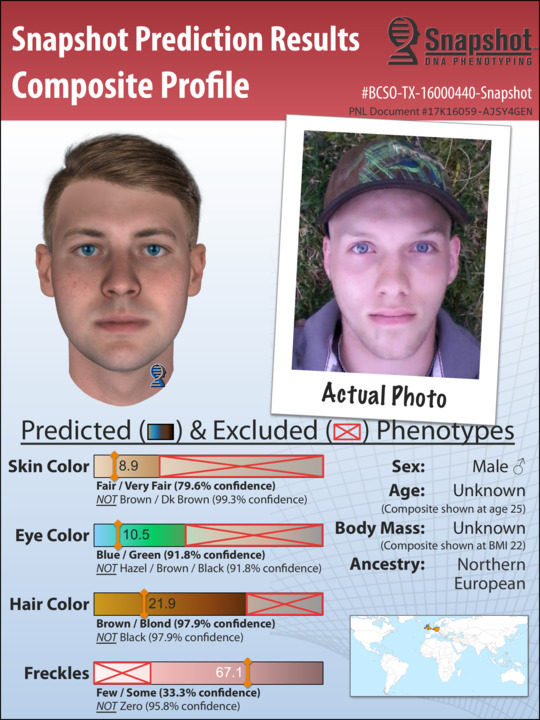 Within weeks, Parabon produced the report which revealed the perpetrator to most likely be a white male of European ancestry with brown or light brown hair, blue or green eyes and some freckling. In a press conference on 8 November 2017, Sheriff Hill released the results to the public. "DNA Sketch Leads to Confession"
Within hours of the Snapshot release, BSCO received numerous tips about the suspect's possible identity. One of the candidates was Ryan Derek Riggs. Investigators soon learned that Riggs lived nearby with his parents and was an acquaintance of Blankinship and her boyfriend. They also noted that Riggs was a suspect in an unconnected illegal dumping case at a location near where Blankinship's body had been found. When BSCO paid a visit to the Riggs residence, Ryan was nowhere to be found. He did not return home and eluded police contact in the days that followed. Having evaded police for nearly a week, just six days after the Snapshot report had been released to the public, Riggs surprised the community by confessing to the murder of Chantay Blankinship before his church congregation. Later that evening, he also confessed to BSCO investigators. Sheriff Hill said Riggs was "not even on our radar" prior to the release of the Snapshot report. Riggs was charged with the capital murder of Blankinship after he provided details of the crime scene that only the suspect would know.